Young Finns Lord Fist were the discovery of this week among a number of other short releases by unknown bands I had a chance to go through. Their EP Wordless Wisdom of Lord Fist took me straight back to the early 80s high school days, where the main concern was how to pick up girls, and these joyful tunes built around noodling and swirling guitars might just do the trick. 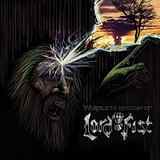 The melodic acoustic intro of Lord of the Night, its prominent riff, the prancing rhythms, as well as so many other moments on Wordless Wisdom of Lord Fist just scream NWOBHM. Early Maiden at the beginning of their careers would have been proud of the gallop Lord Fist unveils on Headless Rider. While melodic touch rules mightily on Wordless Wisdom of Lord Fist, bringing pulsating bass into the foreground adds heaviness on Velvet Gods. At the same time, timid production lacking punch doesn't quite allow this music to come to its full potential. Guitars are outstanding picking their way through the riffs, so more depth at the bass/drums foundation would simply make the presentation stronger. Another aspect holding Lord Fist back somewhat is their vocals. Doing the Aces High yelps on Velvet Gods is probably the highlight, since timidness, just like the production sound, is Perttu Koivonen’s singing trait here. Asking more of him to carry the song on Fire Within doesn't quite help the song to hit that occult plateau King Diamond and Ritual can do. Instead, the song sounds a bit naive, hitting its stride not with the main riff inflection but on the meditative middle-to-end outro. My criticism perhaps overly emphasized I want to repeat that I really liked Wordless Wisdom of Lord Fist. It is only because I did so that I kept spinning it uncovering more ground for the aforementioned criticism. Lord Fist may sound dated, which is on purpose. Dated in this case does not mean stale, but instead refreshed, like a well preserved and polished patina on an antique piece getting another chance on display.